The Jack Hanley Gallery is pleased to present “Autos”, a solo exhibition of photographs by Bernhard Fuchs. 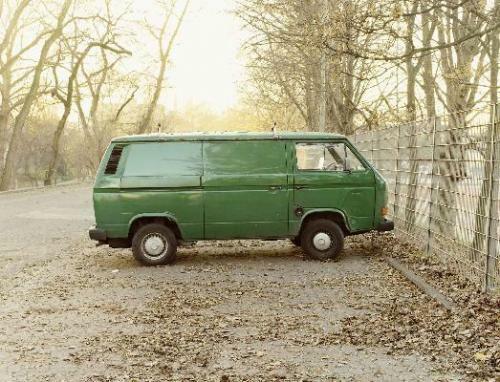 The series “Autos” is a collection of images of cars parked in parking lots and on roadsides. Their stillness haunts, their solitude mystifies. In the absence of human life, the cars in Fuchs’ landscapes take on their own pulse, their function moves beyond expected utility. Here, in a moment of the “happened upon,” travel freezes in contemplation. Born in 1971 in Haslach an der Mühl in Upper Austria, Bernhard Fuchs studied with Bernd Becher at Kunstakademie Düsseldorf and with Timm Rautert at Hochschule für Grafik und Buchkunst Leipzig; he currently lives and works in Dusseldorf. Since 1991, his work has been exhibited in Germany and abroad: Museum Ludwig , Cologne Germany; Museum Folkwang, Essen Germany; Goethe Institute Washington D.C. and Paris. Several of his photographic series including “Autos” have been published internationally in monographs of his work.